I have a neighbor who was country born and country bred. His cat is never allowed in the house. He feeds the cat outside, near his back door. I don't think he realizes that the food the cat leaves behind attracts flies, mice, rats, and other pests, including possums. Any leftover food should be promptly removed after a cat or dog has eaten. 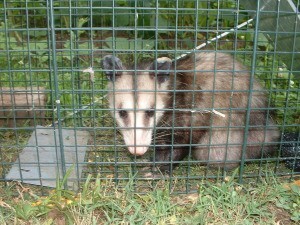 The picture shows a possum I caught in a trap I had placed on my neighbor's property. I have released the critter. It just may have a litter of little ones awaiting it's return. I don't even want to think about Granny Clampett serving up this animal with a 'mess' of sweet potatoes. 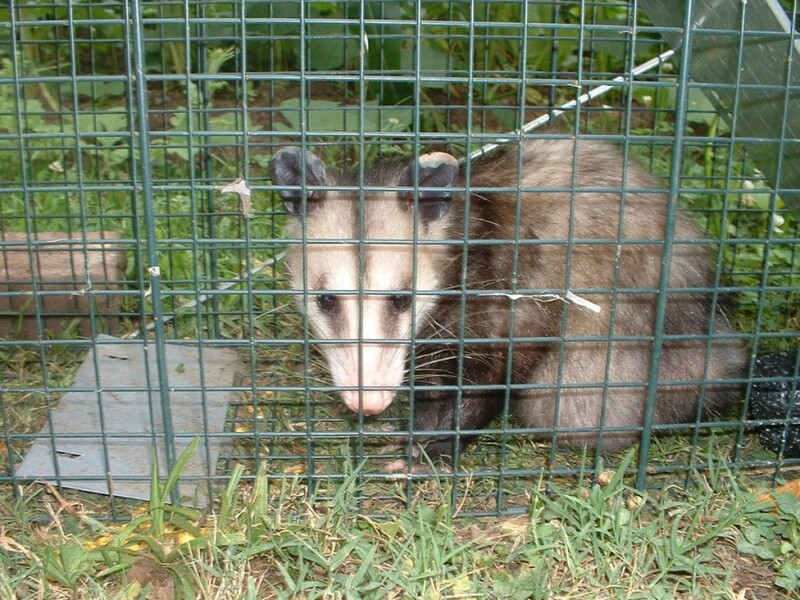 The trap was intended for a raccoon which has started eating my neighbor's corn. Last year, a raccoon destroyed "every" stalk of corn my neighbor had planted. It also destroyed "every" stalk of corn I had planted. That hurt! My husband and I used to leave food out for the opossums and we would watch them come to eat at dusk. We were both country born and bred but we love animals of all kinds. I also leave food out for all the little critters...5 crows, 2 squirrels, 2 skunks, 1 raccoon, a couple of stray cats, and a mouse who lives under the front step. I have 3 bird feeders, and a bird bath as a water source. I figure that since the animals were here before people moved in and took over their habitat, we should share our food with all of them. This is very true. Cat food near the back door will bring animals closer to the house. Plus the rain gets on the food and ruins it with mold. I did this in the past by putting food, way far away from my house, but where I live, the cats rarely get it, the wild animals do. I live wild animals, don't get me wrong, including black bears, but do not want to surprise one or run into one. It's better that I feed my cats in the house. i feed my possums and racoons. love em. It seems that likekinds originally posted this article in 2014 but receives comments every time Thriftyfun re-posts it. So many different opinions - how wonderful it is that everyone can express their likes and dislikes according to their particular lifestyle. I personally love most wild and tame animals but that does not mean that I want every kind to set up habitat in my back yard. I do not wish to harm them, but, if necessary, I will set up a trap and remove them to a better suited "home". One summer our cat decided she wanted to be outside all day and night. My mother said to go ahead and put her food and water out. Then, here came the raccoons, skunks and possums. Then more raccoons skunks and possums. Then they started fighting amounst themselves. Our poor kitty! They didn't try to get her but she was scared. So I went out and frightened the critters away, and brought her and the food and water in. I never fed her outside again.